It’s not something I’ve ever thought to write about, imagining few others would find keeping empty wine bottles as compulsive a habit as I do. 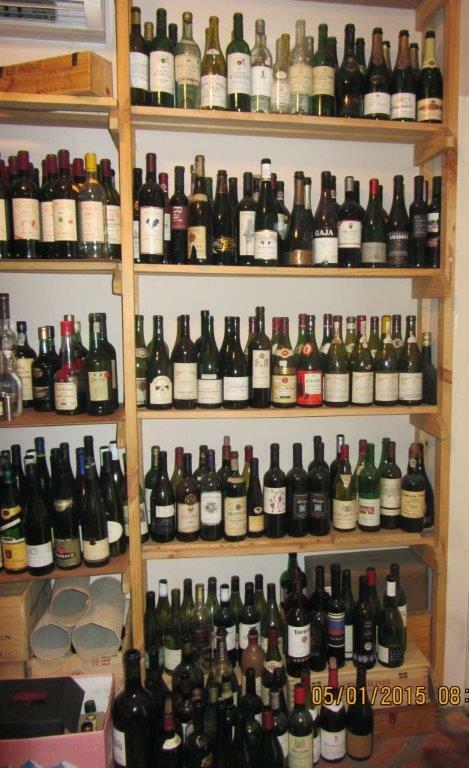 fact, here’s a photo to illustrate just how compulsive it is – it spreads further around the cellar too. And it’s about to be joined by another bottle with happy and sad memories. It was around 1997, when I was writing for the excellent Sunday Life magazine, that the editor passed on an email from a gentleman in Australia, who had several queries about South African wine after his recent visit, including why did South Africa have so much chenin. Little did I know that my response would lead to an active and robust ongoing correspondence. It turned out Patrick was South African but had emigrated to Australia in 1961. His interests ranged far and wide, including sport – we had much friendly banter about our respective cricket teams – but wine was one very close to his heart. Our correspondence grew both in length and regularity; I learned a lot about Australian wine from him and I think he did likewise about South African wine from me. The opportunity to meet in person rather than over the ether arrived in 1999, when Mark and I visited and travelled through Australia; Patrick and his wife, Elizabeth invited us to stay with them during our stay in Melbourne. They treated us royally with visits to wineries as far afield as Heathcote and Mornington Peninsula, wines as varied as Grange (from the 1970s) to Chambers fabulous Rutherglen Muscats. We met twice more, once in Melbourne again, another when they stayed with us in Cape Town. That was to be the last time we met, though our interest and enjoyment in each other’s wines continued; with little possibility of buying them, we started the slow but thankfully successful system of posting a selection to each other via seamail. Whilst I sent Patrick wines which I hoped would convince him of our progress with the classic varieties ( lots of chenin!) and innovative wines such as white blends, he educated me with some of the many ‘alternative varieties’ which have become such a success in Australia. As a resident of Victoria state, he did favour local producers (although in one notable package, Margaret River, Barossa, Adelaide Hills and Langhorne Creek were represented), but there’s such a wealth of talent and wide range of interesting varieties and wines in that state, that opening the latest parcel was always filled with anticipation. letter informed me he’d eventually found a bottle of Cobaw Ridge Lagrein 2008, which he was posting together with a Chateau Tahbilk Marsanne 2003 from 1927 vines. Sadly, it was the last letter he managed to write; cancer and other painful complications led to his death that October. I wanted to share those last two wines with friends; two opportunities, a year apart, presented themselves. Once a year in January, our monthly tasting group holds a bring your own international wine and a plate of food event. The tasting’s blind, as always. 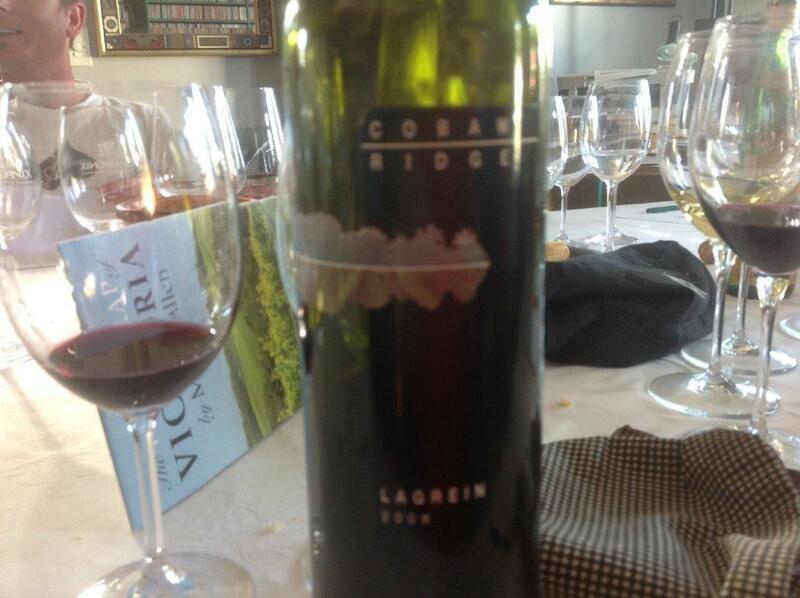 The Tahbilk went down very well last year; yesterday evening it was the turn of Cobaw Ridge Lagrein. Without exception, including Aussie and ex-Melbourne sommelier, David Clarke, all were somewhere in a cool climate region of the northern hemisphere. All were fooled too by the still vivid youthful purple hue, three years the average guess at age. Though none of us are that familiar with lagrein, the wine grabbed everyone’s interest in its freshness, clarity and texture, certainly individual. I’ve drunk the last drop – shared with Mark – this evening; it lingers, as will the empty bottle in our cellar.